Besides electing three members of city council in November, voters in Harrisonburg will also be picking school board members. Unlike most years, the school board races seem to be more competitive than city council. There are three, four-year seats available and one, two-year seat up for grabs. As the school board is nonpartisan, none of the candidates will have a party affiliation listed on the ballot. The five candidates for the three, four-year seats are: Nick Swayne (current vice chair of the school board who is seeking reelection), Tom Domonske (who is also hoping to be reelected), Deb Fitzgerald (the chair of the Harrrisonburg Democratic Party), Kaylene Seigle (the leader of the local Young Republicans), and Dany Fleming. Mr. Fleming, as you may recall from an earlier article, previously served on the school board, but lost his seat for representing a part of the city that he was not legally eligible to represent. When Kelley Rooney (who was elected in 2014) resigned her seat earlier this year due to relocation, the school board appointed Mr. Fleming to fill-in until a special election could be held. As mentioned, that seat with two years remaining is also up for election with Lauren Penrod and Bill Wilson vying for the one opening. Curiously, at one point Dany Fleming was apparently running for both the school board and also seeking a seat on city council. When I visited the local registrar’s office recently, I asked if it is legal for one candidate to run for these two offices at the same time, because it certainly isn’t permissible to serve on both city council and school board concurrently. However, Mr. Fleming did not win the Democratic nomination for city council at their meeting on June 13th and thus he ended his bid for that office. Although school board races are typically low-key races and often uncontested in Harrisonburg, this year could prove considerably more interesting, especially given that we have both a Democratic and a Republican Party leader seeking office. It should be interesting to see what happens. Earlier today, the Kai Degner campaign held a gathering in downtown Staunton, Virginia. Mr. Degner, a member of the Harrisonburg City Council, began his campaign about two weeks ago after the unexpected departure of Tom Howarth, the previous Democratic Party nominee. The event, held in a local coffee shop, attracted about fifteen or so individuals, most of whom came from either Staunton, Waynesboro, or Augusta County. The meeting also included one full-time staffer for the Degner campaign and a regional employee of the Democratic Party of Virginia. During the meeting, Degner outlined his three major policy goals: criminal justice reform, sustainable energy policy and climate change, and various election improvements including campaign finance reform and tackling gerrymandering. In an unusual twist, he asked of the attendees to introduce themselves as well and explain what motivated each to take an interest in this race. One goal of the Degner campaign is not simply to activate the traditional Democratic base, but also reach out to conservatives and libertarians who have either voted for his opponent in the past, or have not been involved. As he pointed out, the 6th is a very Republican district. For example, in recent elections, when Democrat Sam Rasoul ran in 2008, he captured 37% of the vote and Andy Schmookler won 35% in 2012. With this thought in mind, Degner hopes to draw additional interest in what has been to this point a fairly noncompetitive, safe Republican seat. He will face Republican Bob Goodlatte, the 23-year incumbent in the fall election. The campaign had another another event later in the day in Harrisonburg. You can learn more about Kai Degner and his campaign at KaiForCongress.com. In recent elections for the Harrisonburg City Council, both the Republican and Democratic Parties have fielded a full slate of candidates for office. Most years independents run as well, and, for the first and so far only time, in 2014 the Libertarian Party had a candidate too. However, 2016 is proving to be an odd year. Three council seats are up for election and the window for candidates to file is now closed. Two sitting members, Kai Degner (a Democrat) and Abe Shearer (an independent) are not running for re-election, while a third member, Richard Baugh (a Democrat) is seeking office again. As is typical, the Democratic Party has three candidates for these three seats, Deanna Reed and Paul Somers join Mr. Baugh. George Hirschmann is running as an independent. However, in a previously unheard of move, the Harrisonburg Republican Party has nominated zero candidates for city council. I cannot recall the last time the Republican Party didn’t nominate at least one candidate for city council, let alone a full slate of two to three candidates. It does beg the question, has the Harrisonburg Republican Party given up? Back in 2003 and 2004, I lived in the city of Charlottesville. During that time, they held an election for city council, but curiously none of the Republican candidates ever made mention of their Republican label. If I recall correctly, in the ensuing election the Democratic candidates won easily. Throughout that election the mood of Charlottesville Republicans was one of inevitable defeat, as you might imagine it was a very depressing scene. Has this same realization hit the Harrisonburg Republicans? After all, only one Republican candidate has won in Harrisonburg when facing a Democratic opponent since the 2009 elections. I am reasonably certain that presumptive Republican presidential nominee Donald Trump will not win the city of Harrisonburg. Therefore, running under the same banner of Trump will likely drag Republican city council candidates down in much the same way that Mitt Romney hurt the 2012 Republican city council candidates. If we saw a bunch of independents in this cycle, that reasoning could very well explain the lack of Republican candidates. However, as mentioned, there is only one independent this time. Conversely, has the Harrisonburg Republican Party jettisoned any and all semblance of political principles so that no self-respecting conservative or libertarian would consider taking up their mantle? Although I believe that the Harrisonburg Republican Party doesn’t really have any interest in advancing the ideals of limiting government, that still doesn’t explain why there are only four candidates running for the three seats. Unfortunately, I believe that Harrisonburg is transitioning into a single-party city, much like the Byrd machine of last century. Although not insurmountable…at least yet, I would argue that affiliation with the Democratic Party gives a candidate an instant advantage. Given the growing voting JMU student population and the far more effective Democratic college outreach than Republican, coupled with a weak, ineffective, and often surrendering Republican leadership at the Congressional level, and that the GOP at the local, state, and national level have nominated some candidates over the years that are virtually indistinguishable from their Democratic opponents when it comes to policy has created an climate where the Democratic Party now thrives and the Republicans have found themselves on the brink of extinction. Some people theorize that 2016 might spell the end of the Republican Party as a major, national political party in the United States. Much like the demise of the Whigs in the 1850s, a new or existing political party will rise up to take its place. Well, whether it survives nationally or not, does the lack of Republican candidates in the 2016 elections for city council coupled with a Facebook page which hasn’t been updated in over six months and a dead link to their seemingly defunct website mean that the Republican Party is no longer a factor in Harrisonburg politics? Earlier today, I received word that long-time Shenandoah Valley political activist Suzanne Curran has died. A resident of Shenandoah County, Ms. Curran was the program director for the Shenandoah Valley Constitutional Conservatives, which holds a monthly gathering at the Denny’s in Mt. Jackson. She was also heavily involved with the Republican Party of Virginia, serving as the Western Vice Chairwoman. Although Ms. Curran and I disagreed over candidates, for example she supported Ed Gillespie for U.S. Senate in 2014 while I preferred Shak Hill over Gillespie for the Republican nomination and Libertarian Robert Sarvis over Gillespie for the general election, and she was an ardent supporter of Ted Cruz for president while I was not, I admired her for steadfastly standing up for her principles and her willingness to stand behind them even if doing so upset Republican Party bosses and elected officials. She was a courageous woman and I appreciate that she treated me with respect and dignity in a time when many in the GOP shunned me. I’d like to share two memories of Suzanne Curran. The first is from the 2012 6th district Republican convention. Ms. Curran was seeking a spot as a delegate to the RNC National Convention that year. Although she was a supporter of Newt Gingrich (while I was for Ron Paul), I thought that she easily gave the best speech of any of the candidates, speaking of the importance of principles and working together to achieve common goals. 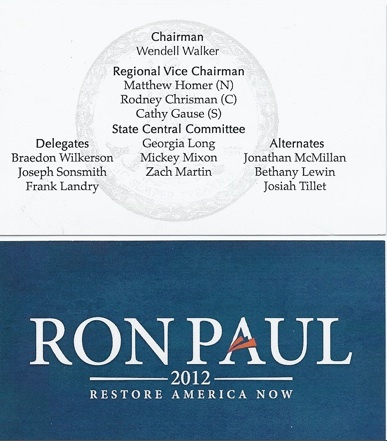 The Ron Paul campaign had their own preferred slate of candidates (as pictured), but as I thought Ms. Curran was more honorable than one of the “chosen ones”, I cast one of my votes for her instead. I was disappointed when she didn’t win. The second recollection is more recent. Several months ago, I wrote what I thought was a quite controversial piece about the race for Republican National Committeewoman. Shortly thereafter, I attended a political dinner and Suzanne Curran was there too. She came up to me and said she had to shake my hand, which she did, and then thanked me for writing the article. Life is an odd thing really. Only a handful of days ago, on June 3rd, I had lunch with Suzanne Curran in Harrisonburg at First Friday. During that time she displayed her usual spirit and vigor. Just two weeks prior the 6th district Republicans elected her to serve as a delegate to the Republican National Convention and I’m sure she was excited to attend, especially after she fell short in 2012. Now, her space will be filled by another. Who knew that she would be gone so soon? Suzanne Curran was a woman who would not allow anyone to bully or intimidate her and, from time to time, she would encourage me to stand tall too. It is my great hope that Suzanne Curran’s life will serve as an inspiration, especially to young women who share her passion for politics. Suzanne Curran was a good woman; I miss her already. On Sunday evening, I joined several friends in watching the German film, The Lives of Others or, as it is called in German, Das Leben der Anderen. The movie portrays life in East Germany, with a heavy focus on the activities of the Stasi, the secret police of East Germany. It is a bleak existence where anyone and everyone can be placed under surveillance without warrant or probable cause and unquestioned loyalty to the state and her leaders is demanded of all. The Lives of Others serves as an important reminder of what happens when a people surrender their civil liberties in the name of security. It isn’t hard to see the United States drifting in this direction with the creation of the TSA, warrantless wiretaps, unlimited detentions of terrorist suspects without trial, and related activities. However, what I found particularly impactful was a personal connection. In the film we meet a character named Albert Jerska. Although a theatrical director, he fell out of favor with the party leaders for expressing anti-government opinions and thus was blacklisted, unable to continue to work in his field. Looking back, for me my blacklisting likely began with my support of Karen Kwiatkowski in the 2012 Republican primary over Representative Bob Goodlatte. Although Goodlatte hasn’t been a particularly principled legislator during his several decades in office, there is no doubt that he has amassed considerable power and influence, especially in the Shenandoah Valley of Virginia. Unfortunately, over the years I’ve had several nasty run-ins with some of Goodlatte’s staffers. One memorable example was in March of 2012. Another took place in the fall of 2014 when I was harassed by one of his local goons who he later promoted to his Washington D.C. office. I was surprised when I was expelled from the Harrisonburg GOP in early 2014. However, what was even more surprising was that when I asked the local chairman why I was kicked out, he told me it was done at the request of Bob Goodlatte’s staff. This revelation spawns several questions. Why would Bob Goodlatte take such an interest in the affairs of a local unit and an activist such as myself? Why would a local chairman kick out a member based upon the request or demand of a legislator? Based upon this event, has Bob Goodlatte and his staff been working behind the scenes to blacklist me from future political employment as one local GOP leader seemed to hint? And, does it concern anyone else that a member of Congress seems to wield enormous power over the lives of others in a fashion disturbingly reminiscent of a Stasi official? In The Lives of Others, when Stasi Captain Wiesler discovers that a writer in East Germany is questioning the actions of the government, he is faced with a difficult choice. Does he turn the writer in for subversive activities? Or does he keep it secret because he realizes that both the Stasi and the government are corrupt and trample upon the liberty of the people, even though he knows revealing this truth puts his career, liberty, and even his very life at risk? Earlier this year Bob Goodlatte’s people attempted to install city and county party chairmen up and down the 6th district whose primary loyalty would be, not necessarily to Republican ideology, but to Goodlatte. Surprisingly, they were largely unsuccessful. Am I wrong in thinking that in a free society one should be judged according to his or her merits and not simply rewarded or punished based upon loyalty to party bosses? Step by step I worry we are becoming more like the now defunct East German government, complete with their network of informants and secret police. I wish that more people would stand up for principle rather than unquestioningly siding with a party or a political official, especially when they know that that person or group is engaging in morally questionable or hypocritical behavior. Unfortunately, doing so is the riskier path that many avoid which is one big reason why the power of the government expands and political leaders grow more and more unresponsive and dictatorial. The Lives of Others is a stark portrayal of what happens when the government and its officials stop viewing themselves as servants of the people and instead treat the public as their vassals. If we wish to remain a free people, we must resist this kind of thinking at every turn and not be afraid to speak out boldly whenever we hear of it. On the morning of Wednesday, June 8th, Andy Schmookler and I held our monthly political radio hour on 550 AM, WSVA. The topics of discussion were: Tuesday’s Democratic primary and Bernie Sanders’ future, Donald Trump’s election chances, the 6th district Republican Primary, the 6th district general election, and more. If you missed the show, you can listen to it here. On Monday, June 6th, a group of Libertarians planned to gather in Charles Town, West Virginia, for a social meeting. Although I’ve read about a lot of Libertarian meetings in various parts of the state, they were always very far from the Shenandoah Valley of Virginia, places such as Charleston (about 240 miles) or Parkersburg (about 220 miles). Therefore, when I heard that they were meeting in the panhandle, only about 90 miles away, I thought this gathering might be the best and only opportunity to meet some like-minded folks from our neighbors to the north and west. However, the name West Virginia can be somewhat misleading as Jefferson County, the easternmost county in West Virginia is actually east of the Shenandoah Valley. About a dozen people attended. With the exception of the three candidates, the group lived in various places in Jefferson County, with one or two hailing from the neighboring Berkley County. At the same time, the Charles Town City Council held a meeting to discuss a new anti-discrimination policy and one or two folks at the Libertarian gathering stepped out to listen to the proceedings. As mentioned, the three candidates were: David Moran, the Libertarian candidate for Governor of West Virginia, John Buckley, the Libertarian candidate for Secretary of State, and Brenton Ricketts, who is running for state auditor. Unlike Virginia, which only elects three statewide office holders in the year after the presidential election, West Virginians vote on six in presidential years, and the Libertarian Party has a candidate for each position. While there I learned more about how West Virginia politics and elections differ from Virginia. Given that Virginia has a very high threshold for official party recognition of 10% of the statewide vote, we only have two political parties. West Virginia, with a threshold of only 1% has four. Along with the Republicans and Democrats, they also have the Libertarians and the Mountain Party (which is an affiliate of the Green Party). Another interesting fact is that although Virginia has more than eight times as many residents, both states have the same number of members in their House of Delegates at 100, and West Virginia has only six fewer state senators than Virginia. There are several Libertarians running for state office this year and one candidate for House of Representatives too. In addition, West Virginia has voter registration by party, but again voters can choose from any of the four parties or register as an independent. Apparently, the West Virginia Libertarian Party has seen a swell in registration in recent months. During the evening, I spoke with a former Republican as well as a leader of a local Young Republican group who attended the gathering. I told them about the loyalty oaths that the Virginia Republican Party makes their members sign and the penalties enacted upon those who broke party ranks (for example, if they voted in another party’s primary). Both seemed to think that these kinds of restrictions and demands from the RPV were completely absurd. In addition, as John Buckley led the West Virginia delegation at the recent national Libertarian Convention in Orlando, it was fun to hear his thoughts of the event and his opinions of the candidates who ran too. And, by the end of the night, I picked up two new Facebook friends. With the general dissatisfaction with Republican candidate Donald Trump and the Democrat candidate Hillary Clinton, will the Libertarian Party experience an upswell in interest and votes? Will disaffected conservatives and Bernie supporters buck the two major political parties by supporting someone like Gary Johnson, or will they obediently fall in line, casting their vote for whomever they decide is the less evil option? Overall, it was a good event in Charles Town on Monday night. I hope I can attend another gathering before too long. For those who haven’t been paying attention to recent political news, over the weekend the Libertarian Party held their national convention in Orlando, Florida. There they nominated former New Mexico Governor and 2012 Libertarian candidate Gary Johnson as their candidate for president. For vice president, they selected Bill Weld, the former governor of Massachusetts. Although, unfortunately, I wasn’t able to attend the convention, I watched much of the event on C-SPAN, as it was broadcast on national television. On Tuesday, I had two opportunities to offer my thoughts of the convention and the Libertarian candidates for president and vice-president. In the morning, I spoke on the radio, 550 AM WSVA. If you missed the segment, you can find it here. Then, in the evening, I got together with Will Hammer, Corey Fauconier, and Andy Bakker at Freedom Gulch as we engaged in a bit more in-depth conversation. Could 2016 be the break out year for the Libertarian Party? Well, with a ticket headlined by two former governors, a Republican and Democratic candidate with very high negatives, and inclusion in the national polls, just about anything could happen. No matter the outcome, 2016 is shaping up to be one of the most exciting election cycles in recent history.